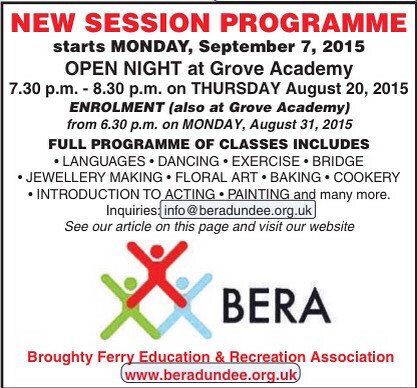 BERA, a registered charity and voluntary organisation in Broughty Ferry, has been delivering adult evening classes for around 30 years. Their 2015-16 autumn session starts on September 7 2015 and runs for 10 weeks (with a break for the October school holidays). Most classes will be at Grove Academy, with zumba, mature movers (an activity class aimed at older people) and ballroom dancing taking place at Forthill Primary. Other classes will include old favourites like languages, bridge, yoga and meditation, needlecraft and there will be some new opportunities including jewellery, acting and bakery. There is a strict minimum of 12 enrolments required per class. This is to avoid any rise in fees, which currently compare favourably with those of other providers. There will be an open night at Grove Academy from 7.30-8.30pm on August 20, where prospective students can meet members of the BERA committee and the tutors, giving everyone a chance to find out what the classes involve. Further information will be available on social media. An enrolment evening follows on August 31 from 6.30pm. Paper copies of the programme will also be available in the Broughty Ferry Library and other public areas, as well as on the Facebook page (www.facebook.com/beragrove) and on the website from mid-August.